Oh dear. 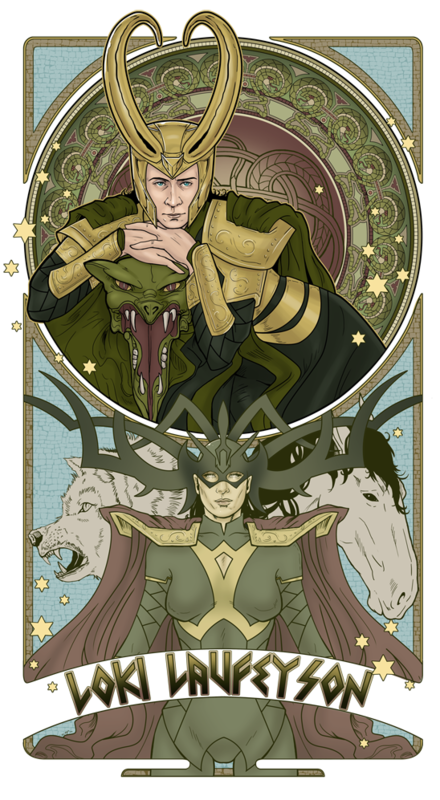 I've gone all fangirl over the work of Heather Carlton, aka DeviantArt's Hezaa, today and I'm betting Tom Hiddleston fans will feel the same way after seeing this awesome Art Nouveau Loki piece. Loki's children, the Midgard Serpent, Fenrir, Hela, and Sleipnir accompany the God of Mischief in her Alphone Mucha inspired work. It isn't available for purchase yet (check her DeviantArt page for updates) but, until then, feel free to just stare dreamily at the screen sighing contentedly.